Thanks for wearing it pink! Thank you to everyone who has joined us to host fantastic wear it pink events for breast cancer research. We’ve really enjoyed hearing all about your events and seeing your fantastic photos. As 2018 is fully upon us, we wanted to share that we’re are already getting completely stuck into exciting plans for this year’s wear it pink day! But before we move on, we’d love to do a quick run through the best bits of last year. We wouldn’t be able to continue funding our vital research without the wonderful support from people like you! So to everyone who wore pink, thank you so much for joining us in 2017. 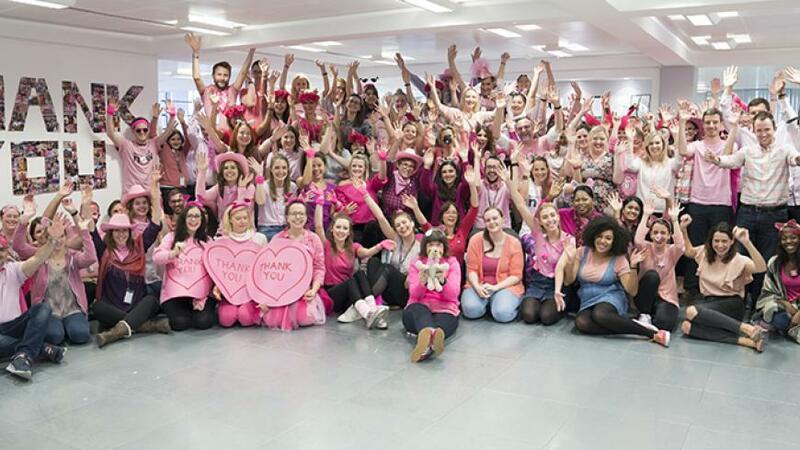 We are truly honoured to have such wonderful fundraisers – and you all looked so good in pink! We’ve heard from so many of you about how much of a success your events have been. Thank you to everyone who has got in touch to share your story, tell us about your day or sent in pictures. If you haven’t told us about your event yet but would like to, we’d really love to hear from you! Just send an email to wearitpink@breastcancernow.org. It’s because of your support that our aim that by 2050, everyone who is diagnosed with breast cancer will live has never looked so bright. Each team delighted us with their fancy dress for our annual competition. We had unicorns, flamingos, superheroes and Loveheart sweets to name a few. But our clear winner was our wonderful research team who came as the Pied Piper and his rat followers. So we’ve baked cakes, worn pink and held our coffee mornings and parties. We’ve celebrated at work, in our schools and within our communities. It’s time to put our party planners to rest, hide our wigs away for a little while and take a look at what a fabulous wear it pink 2017 has turned out to be! And we’re excited to tell you all that so far wear it pink 2017 raised over…. It’s an amazing achievement and we want to thank everyone so much. Now – who’s with us for wear it pink 2018? If you’d like to join us in October for wear it pink 2018 please do drop us an email to wearitpink@breastcancernow.org and we can make sure you’ll be the first to know when registrations open!